The Elder Scrolls told of their return. Their defeat was merely a delay 'til the time after Oblivion opened, when the sons of Skyrim would spill their own blood. But no one wanted to believe... Believe they even existed. And when the truth finally dawns... It dawns in fire! But there's one they fear. In their tongue, he is "Dovahkiin": Dragonborn! —Esbern, Narration of the teaser trailer. The Elder Scrolls V: Skyrim is the fifth entry into The Elder Scrolls main series, released on November 11, 2011 across multiple platforms. It takes place 200 years after the events of the fourth game in the northernmost part of the continent, home to the Nords, as Alduin the World Eater is returning. The people of Skyrim are locked in a bitter civil war between those who support remaining within the Empire of Tamriel and those who wish for independence, united under the leadership of Ulfric Stormcloak. Into this enters what may be the last Dragonborn, a person born with the soul of a dragon, who has the ability to kill the dragons and absorb their souls. Under the guidance of Esbern, one of the last Blades, the Dragonborn must oppose Alduin and defeat him, lest he destroy the world. The game runs on a heavily modified Gamebryo engine called the Creation engine, complete with all the Good Bad Bugs that Bethesda fans have come to know and love. The soundtrack is once again provided by Jeremy Soule. Skyrim is also innovative in that it has an integrated way to browse and upload mods, which can be downloaded automatically via Steam, something that has never been attempted on this scale before. The first DLC for Skyrim, Dawnguard, came out for the Xbox 360 in the summer of 2012. The trailer can be found here. Subsequent DLC called Hearthfires and Dragonborn were also released, and all three were ported to all known versions of Skyrim for Playstation 3 and PC, with the PC version gaining a free High Resolution graphics DLC for download. 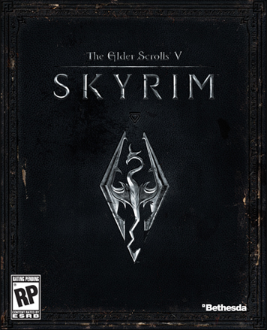 At the end of of October 2016, Skyrim Special Editon was released on all currently generation game platforms as well as Steam, free for those who owned Skyrim and all prior paid expansions, having backported versions of various enhanced features from Fallout 4 as well as integrating all previous DLC into a remastered version of the original game (as a separate install even for prior owners of the original version due to massive changes in the file layout). This page was last edited on 17 July 2018, at 14:03.